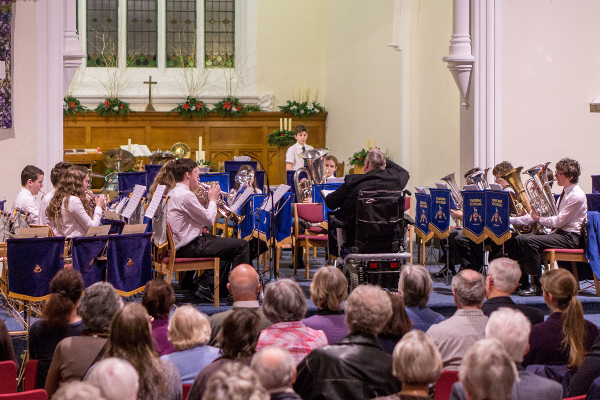 We exist independently of the Senior Band in that we are responsible for our own rehearsals and concerts although we do occasionally join the Senior Band for special concerts such as at Christmas. It is hoped that people who join the Youth Band will develop and move into the Senior Band when they reach the age of 18 but that is not a pre-requisite of being a member of the Youth Band. We do not prescribe a minimum age but generally it is a case of waiting until a child has their second set of teeth, particularly their front ones, but this should not be seen as a restrictive policy and we are willing to let those who are enthusiastic for an early start to give it a try! We welcome people who are absolute beginners as well as those who may already have some experience and whilst our instrumentation follows that of a traditional Brass Band, including percussion, we will do all that we can to accommodate players of other Brass Instruments such as French Horns. Those with no experience are started off on a one to one basis until they are capable of playing a few notes in rhythm in simple pieces of music when they will start to sit in with the Band. There are also opportunities for individual lessons with the opportunity to work towards examinations with the Associated Board of the Royal Schools of Music. Our members are drawn from a wide range of schools and from a fairly wide area. We rehearse on a Monday evening in the Bandroom at Broadwater Park, Farncombe; between the Leisure Centre and the Community Centre; from 6.00pm to 7.50pm. The band’s rehearsals follow the school terms. 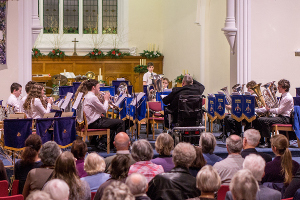 In the Summer Term we usually perform at local school fetes and fairs, at the end of the Christmas Term we normally have a couple of Christmas Concerts and a stint of playing Christmas Carols outside of Waitrose in Godalming and in the Spring Term our focus is towards the Godalming Music Festival. Music encompasses a wide range through styles across the ages and the music we play in the Youth Band equally encompasses a wide range including some from the classical composers through to present day music from the shows and films as well as that of the more popular pieces. If you would like to join us either as a beginner (we have a few instruments we are able to lend out to members) or as a more experienced player we would love to see you. We feel that music-making through groups is of great educational value and individual development. Please contact our Youth Band via email at youthband@godalming.band if you’d like more information or to come along.